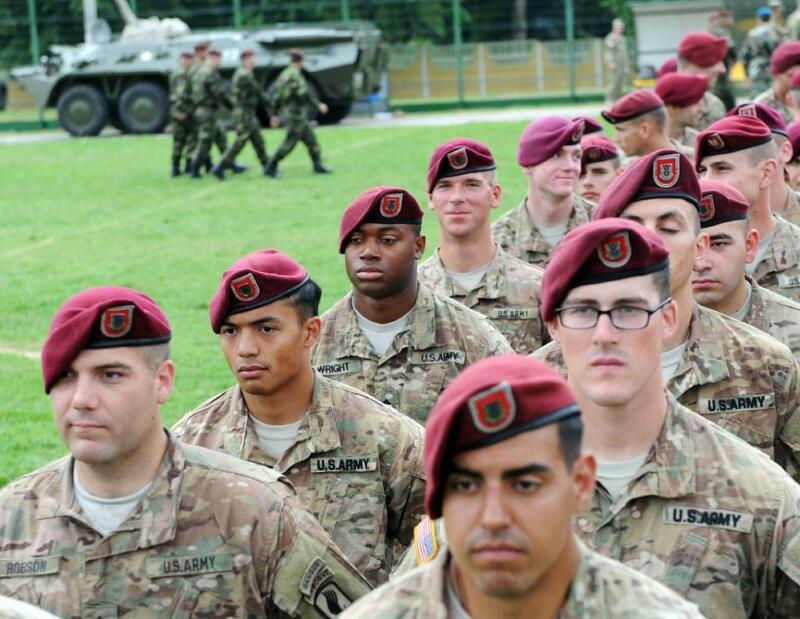 YAVORIV, Ukraine -- Ukrainian and US troops launched fresh drills Monday near the war-torn country's Polish border in a bid to show unity and resolve in the face of an increasingly defiant Kremlin. Ukrainian and US servicemen take part in a ceremony before a drill in Yavoriv polygon, Lviv district, western Ukraine on July 20, 2015. The annual Rapid Trident exercises involve 1,800 soldiers from 18 countries and last for just under two weeks. Their immediate aim is to build morale and cohesion within the ex-Soviet state's outdated and woefully underfunded armed forces -- caught in a 15-month east Ukrainian quagmire battling pro-Russia militias that has claimed more than 6,600 lives. But they also deliver a transparent message to the Kremlin about Washington and its allies' determination to thwart any expansionist ambitions Russian President Vladimir Putin may have. "These joint manoeuvres... display a broad support for Ukraine in its struggle for freedom and sovereignty," Ukrainian forces commander Oleksandr Syvak told the festive flag-raising ceremony. His US counterpart Alfred Renzi said the participating countries -- most of them NATO members but also including such former Soviet nations as Moldova and Azerbaijan -- "will prove an ability to cooperate as one unified force for stability." Russia quickly condemned the war games as a threat to an already shaky five-month truce agreement that aims to resolve one of Europe's bloodiest conflicts in decades by the end of the year. NATO "should understand that such actions... may threaten to disrupt the visible progress (made) in the peace process concerning the deep internal crisis in Ukraine," the Russian foreign ministry said. Putin has always denied charges of orchestrating Ukraine's separatist revolt to unsettle the pro-Western leadership that rose to power in the wake of last year's ouster of a Moscow-backed president. But the veteran Russian leader -- immensely popular at home for his patriotic fervour while increasingly isolated abroad -- has done little to mask his views of eastern Europe being part of Moscow's traditional sphere of influence. Russia set nerves jangling across Europe by sending its fighter jets screaming toward the skies of Baltic and Nordic nations with increasing regularity in recent months. Washington and NATO have denounced such steps as both hostile and dangerous to civilian aircraft. The Kremlin counters that it is only doing what the United States has been for decades -- flexing its military muscle in far-off countries to build a "unipolar world." The launch of Rapid Trident was quickly followed by the Russian navy's announcement that one of its warships stationed off Ukraine's Kremlin-annexed Crimean peninsula would conduct live rocket fire drills Sunday. "After a long interruption and in order to demonstrate the navy's combat capabilities, the Ladny frigate will attack a dummy target from an anti-submarine system," Black Sea Fleet spokesman Vyacheslav Trukhachyov told Moscow's news agencies. Russia marks its annual navy day Sunday and such activities are planned well in advance. But the scale of Russia's celebration this year has been grander than most. Trukhachyov said that more than 30 naval vessels and another 30 jets and military helicopters would show off their abilities near their tsarist-era base in the Crimean port of Sevastopol. The ships will be accompanied by Su-27 interceptor and Su-25 ground attack jets. It was not immediately clear if any senior Russian officials intended to oversee the festivities. Both Putin and Prime Minister Dmitry Medvedev have stirred outrage in Kiev by visiting Crimea in the past year. Yet the Western drills in Yavoriv -- a village lying just 15 kilometres (about 10 miles) east of Poland -- are upsetting to Moscow as well. Russia accuses the United States of funding and arming the nationalist forces that spearheaded the pro-European protests in Kiev last year. Much of Moscow's state media now portrays the West's military involvement in Ukraine as an effort to intimidate Russia and deny its legitimate geopolitical interests.